Non-Toxic Sippy Cup Alternatives. Are you planning to give your baby a sippy cup? Many parents are under the impression that sippy cups are automatically what come next after the baby bottle. Speaking from my own experience, I assumed the same thing. teach your baby to drink from a cup. As you can see, it has nothing to do with sippy cups. In fact, experts recommend that you skip the sippy cup altogether and use a healthier alternative. Why Are Sippy Cups Bad for Babies? What Are the Alternatives to Sippy Cups? When Can You Introduce Sippy Cup Alternatives? What Should You Look For in a Transition Cup? Sippy cups are spill-proof toddler cups that have a rigid plastic spout, although some now have with a softer silicone spout. Sippy cups can come with or without handles. They are usually introduced to babies around 6 months of age, but I have seen some products that are marketed for babies as young as 4 months old. These cups that feature a spout, like the one pictured above in blue, are what you want to avoid. 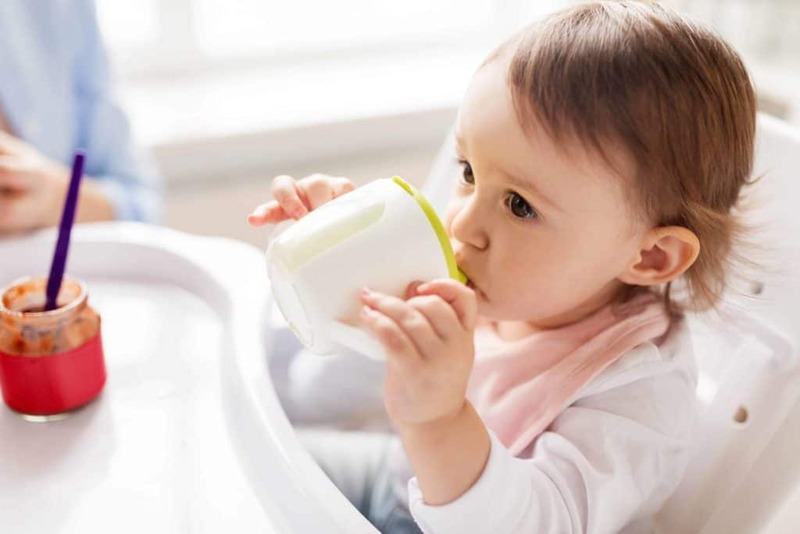 Unless your baby has a medical reason to drink from a spout, experts recommend that you stay away from traditional sippy cups altogether for these very serious reasons. There are some tried and true sippy cup alternatives that you can successfully introduce to your baby. Spoutless “360” cups. These rimless cups make it easy for babies to drink from a cup while preventing spills. They’re great for babies and toddlers alike, but especially for younger babies who are just starting to drink out of something other than their bottle. Straw cups. Straw cups are a safe and developmentally appropriate tool for helping your baby transition away from the bottle. Learning cups. Toddler learning cups are another option for you to consider if your baby has the motor skills to hold one. I know many parents that have success with learning cups, even early on. Shot glasses. Only for the bravest of parents, shot glasses are another surprisingly common alternative. Personally, I wouldn’t feel comfortable using these without close supervision in case of breakage. My recommendation is to decide which approach you prefer and choose from my list of recommended cups below. Then gradually introduce the cup to your baby, stick with it, and give your baby plenty of time to get used to their new way of drinking water or milk. Ask your pediatrician for their advice on what the right timing is for your baby. Most babies are ready to start drinking from something other than a baby bottle around the age of 6-9 months, although some show no interest before 12 months of age. Encourage your baby to start using their new cup, and be patient as they get used to drinking milk or water from an entirely new cup. Mealtime is an excellent time to monitor your child’s exposure to toxins. I always try to avoid plastic in anything used for eating or drinking, and that goes double for my babies. Providing my kids with pure and safe products is one of my top priorities as a mom. Sadly, most mainstream products are made with unhealthy plastics and harmful substances. Though it’s slowly improving, most sippy cups that I find at big box stores still contain harmful plastics and chemicals. Even BPA-free products can contain other endocrine disrupting chemicals that can leach and pose a health risk to babies. And, to complicate things, some brands of non-toxic bottles were found to contain lead and other heavy metals. Unfortunately, it was impossible to avoid products made in China when creating this list. 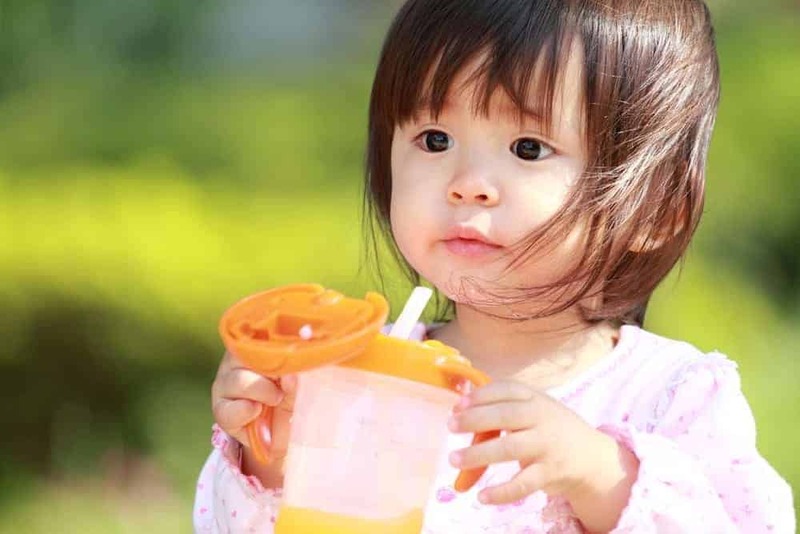 My recommendation is to avoid most of the (plastic) sippy and straw cups that you’ll find at most big box stores and instead choose from this list of non-toxic sippy cup alternatives. Made in China. The Munchkin Miracle 360 Cup is a unique cup that has a patented spoutless rim that eliminates messes and supports kids’ dental health. Drinking from anywhere around the rim, like a regular cup, helps support normal muscle development in a child’s mouth. After initially only making this in plastic, Munchkin recently introduced a stainless steel version (yay!). This premium double-walled, vacuum sealed stainless steel sippy cup keeps liquids cool. The stainless steel is light and durable, and won’t sweat or get little hands cold. The value and collar are made from silicone and polypropylene, respectively, and liquids only make contact with these materials while your child is actively drinking from the cup. This cup is easy to use and clean. It is also the only cup that my kids have a hard time spilling water out of, so that is a huge win in my book. What about lead in this cup? I often get questions about whether to worry about lead since it is a double-walled stainless steel cup. 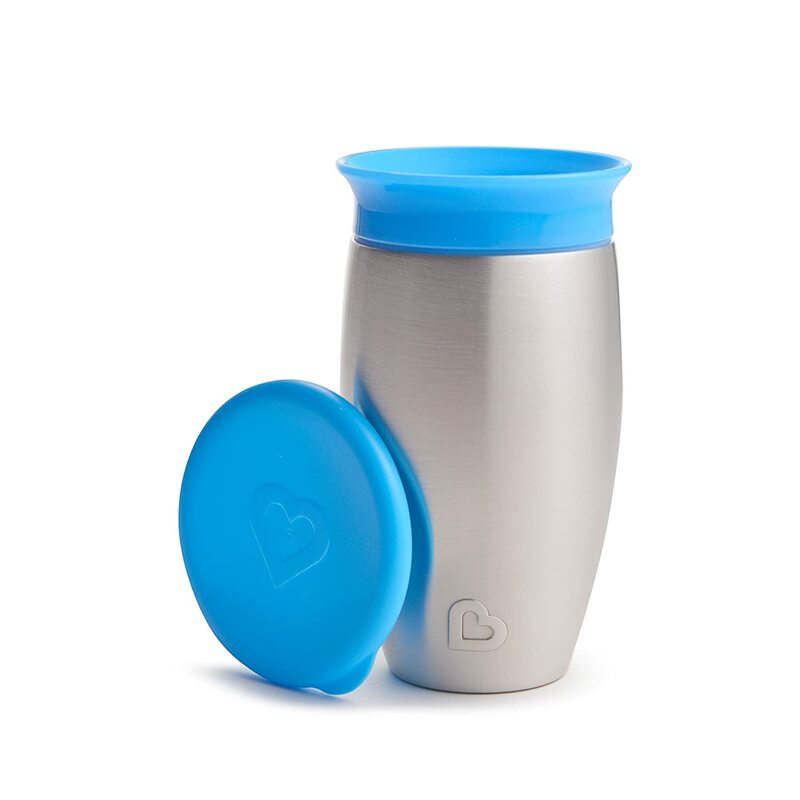 There shouldn’t be anything to worry about with any insulated stainless steel cup unless the bottom seal has fallen off, in which case it could expose a dot that may contain lead. If your cup (or any insulated stainless steel cup) still has its seal, you have no risk of being exposed to lead. Made in China. This is my favorite straw cup for infants. The best thing about this cup is that the liquids only touch silicone and borosilicate glass, which are safe and durable materials that will not leach into liquids. 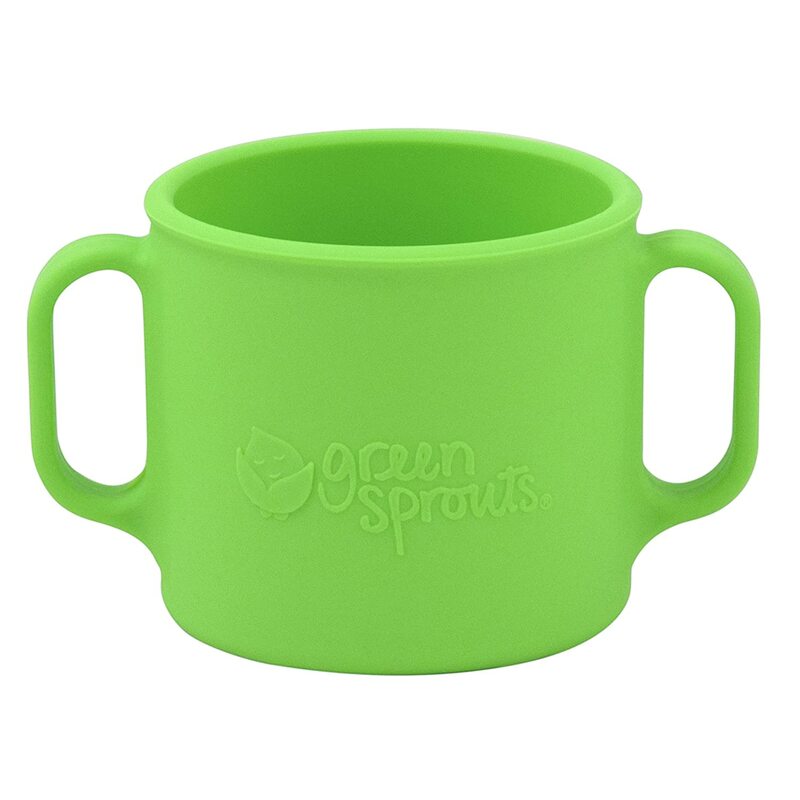 The Green Sprouts Glass Sip ‘n Straw Cup is glass with a plastic shell and shock-absorbent synthetic rubber base to help prevent breaks. My kids have thrown this cup across the room several times and we have only had one break in over three years of use. It comes with two interchangeable tops: a no-drip silicone sippy top for use as a sippy cup (again, not recommended) and a silicone straw top for use as a straw cup that promotes healthy teeth development. My main complaint about this cup is that it takes 7 parts to assemble it as a straw cup, but in my opinion, it is worth it. Sometimes I do let my youngest use it as a sippy cup but that’s usually only when I can’t find one of the straw parts. The handles are polypropylene, which is a stable plastic that I don’t worry too much about. What about lead in this cup? When my oldest was born I searched high and low for a sippy cup that kept liquids away from plastic and this is what I settled on. I have used it loyally and recommended it to my friends and family. However, in 2017, Lead Safe Mama tested this cup with an XRF machine and found it to contain excessively high levels of lead – over 3,000 ppm – on the paint found on the glass insert. There was an entire debacle because Green Sprouts disputed the results and claimed that the CPSC confirmed the product’s compliance with lead safety standards. Ultimately, the company didn’t issue a product recall . It got a little ugly with lawyers involved and class action suits threatened. But, there is a happy ending, sort of: Green Sprouts has remedied the problem by removing the level indicator marks on the glass cup. So there is no paint to be found anywhere on the cup at this time. At this point, you can feel confident that there are no concerns over lead in the Green Sprouts Sip & Straw Cup. Made in USA/Europe. Lifefactory’s 12 oz. bottles are an excellent choice for a non-toxic straw cup. All components are made in the U.S. or Europe and all materials are BPA, BPS, and phthalate-free. The body of the cup itself is made from glass, and the straw is silicone. The cap is made from polypropylene, a plastic which is quite stable. There should be no leaching from this cup. The silicone sleeve provides a non-slip grip and also helps prevent breakage. These bottles are dishwasher safe; just remember to place the cap on the top rack, though I do prefer to hand wash the plastic when possible. Made in China. Another great choice is Kleen Kanteen’s Sport Bottle, though I would only use this for kids who have mastered drinking out of a straw cup. 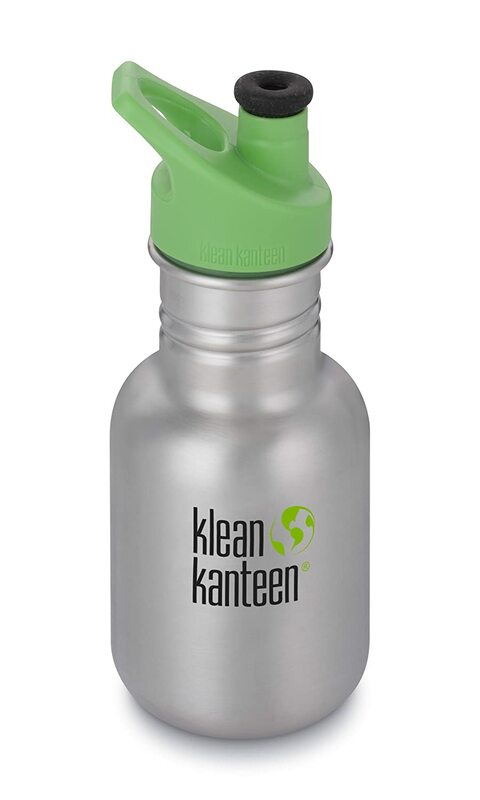 The Klean Kanteen Kid Kanteen Stainless Steel Water Bottle is made of high quality, food grade 18/8 stainless steel, making it very durable. 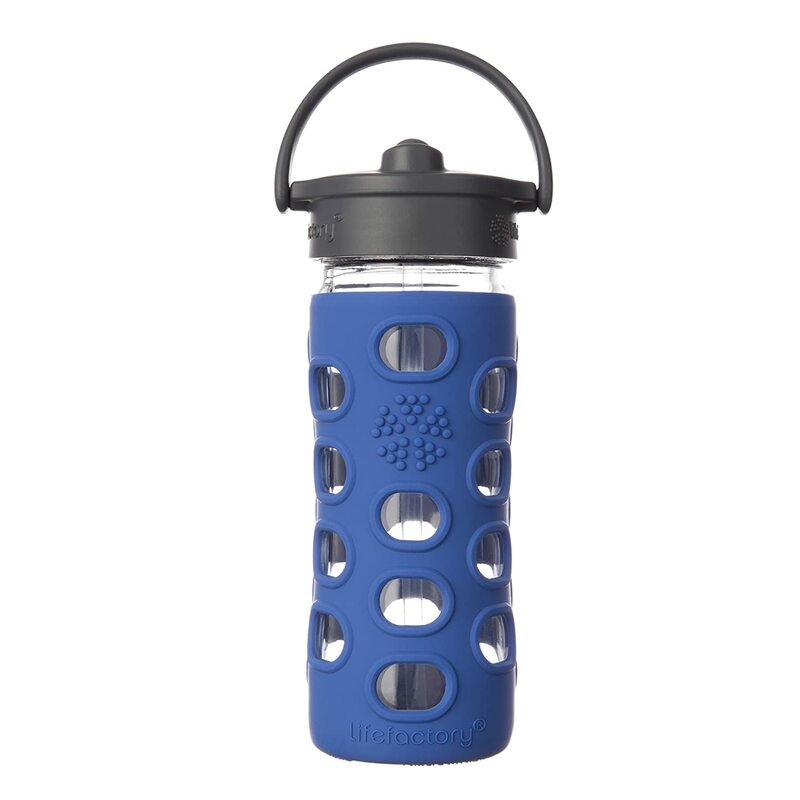 These water bottles come with spill proof caps made from polypropylene (#5 plastic) and food-grade silicone. These caps will resist spills when the spout is in the closed position, however they are not leak proof. The large 1.75 inch opening can fit ice and makes it very easy to fill and pour; compatible with all Klean Kanteen Classic caps, including the Leak Proof Loop Cap. The lightweight single wall design and small form is easy for little hands to hold. Made in China. We’ve tried so many different straw bottles, including the Thermos Foogo and Funtainer cups. We love these and still use them. 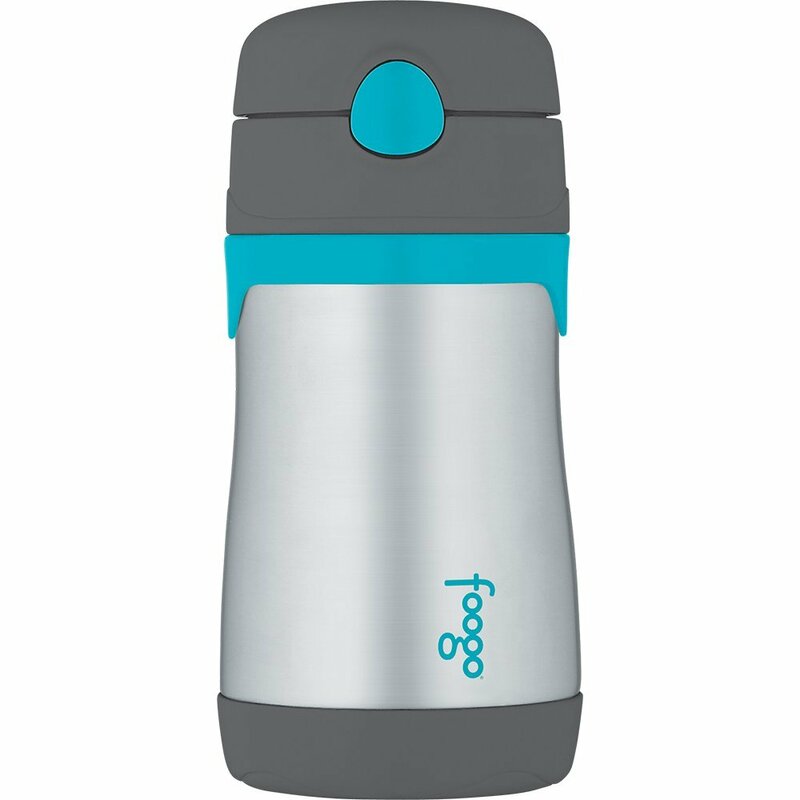 Both are made from vacuum-insulated stainless steel and have silicone straws. We mostly use these when we are out of the house, and what I like about them most is that they allow you to carry 10-12 ounces of liquid at a time. This is much better than leaving the house with a Green Sprouts straw cup, for example, which only carries about 4 ounces. These bottles are also great for day trips because of their size. And I like that they come in so many different styles and colors. It makes it a lot easier to remember which bottle belongs to which child when you can buy them in different colors. This is also useful if you are using these bottles at daycare or preschool. They do leak if the bottle top is open, but they won’t leak when it is closed. Made in China. Made from food-grade stainless steel (18/8), the Pura Kiki Straw Bottle is another great choice for parents looking for non-toxic sippy cup alternatives. It is 100% plastic free and has a silicone straw. Some models come with a silicone sleeve as well. 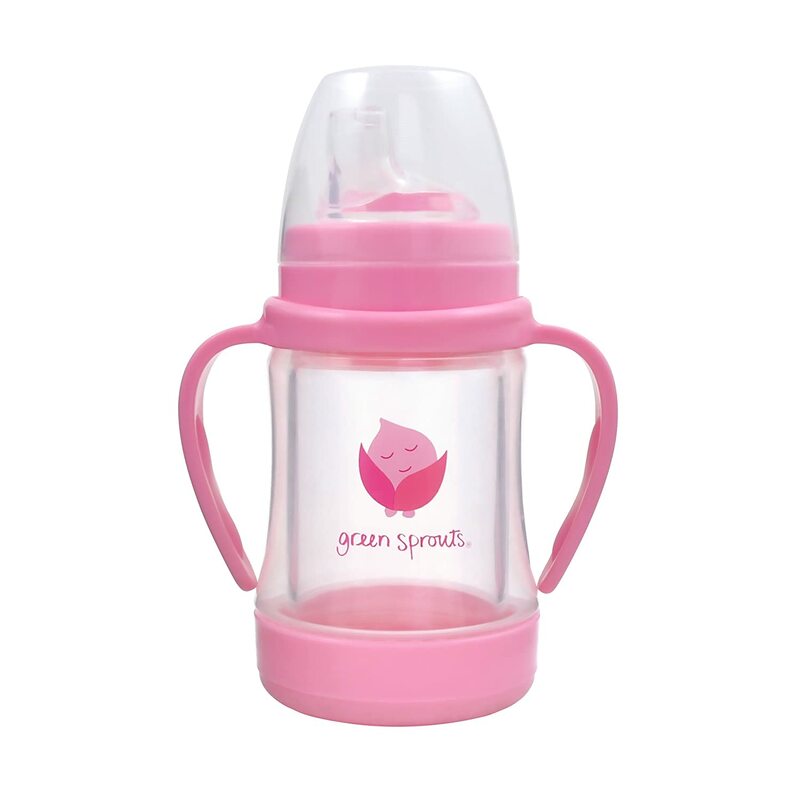 Once your baby outgrows this bottle, it can also be used with Pura’s sport top cap. Though Pura is a popular brand, there are mixed reviews on the durability of this bottle and on the functionality of the straw top. What about lead concerns in this cup? Pura Kiki has been found to have lead in their insulated bottles (but not in their single walled stainless steel bottles, like this one). However, many insulated stainless steel bottles contain the same kind of lead button that Pura Kiki bottles do; the lead button on Pura Kiki bottles is sealed by their bottom cap. When the bottles are sealed properly, there is no risk of exposure to the lead button. However, the bottom caps were falling off of Pura Kiki bottles, thereby exposing many people to the lead button. I debated over and over whether to include any Pura Kiki cups on this list, but I decided to list this one because it is not insulated. It does not have a lead button and does not have a bottom lid. So there are no concerns over lead in this bottle. However, I would NOT use any of their insulated bottles. Made in China. Siliskin silicone straw tops transform any cup into a straw cup. 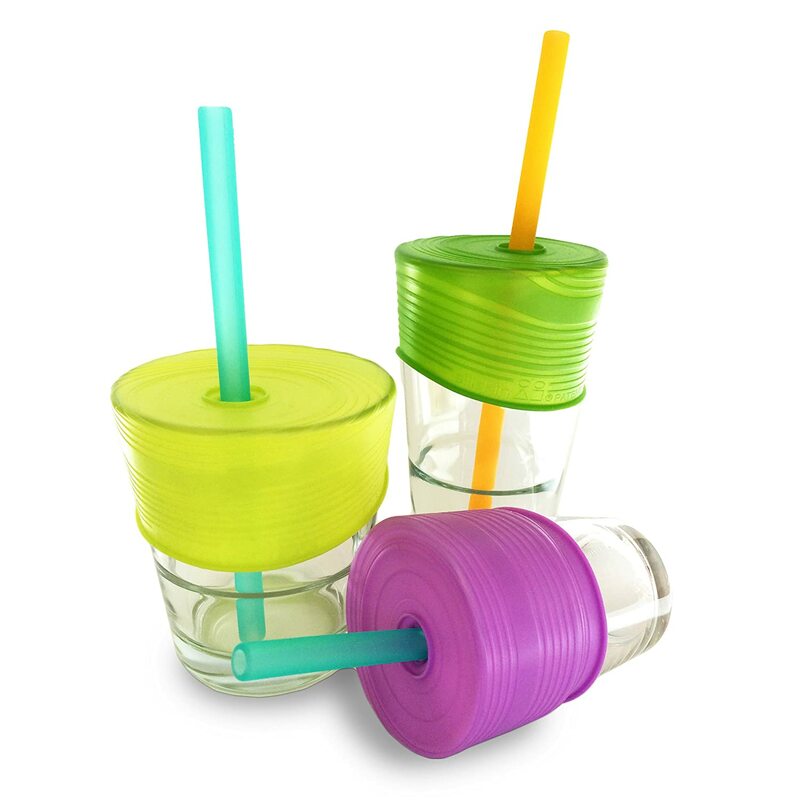 It is such an ingenious idea… simply put one of these lids over the top of any cup, and add any straw (one silicone straw is included with this set) and you have an impromptu straw cup. These lids will stretch over most cup sizes up to 3.75” in diameter. The lid fits any straw size, and being that they are made from 100% silicone, these lids are by nature BPA, PVC, and phthalate free. Made in China. If you’re looking to skip the straw bottle altogether, or your baby is just ready for a regular cup, this could be a safe (non-breakable) option for you. It is made from 100% silicone and has two easy-grip handles. It holds 7 ounces of liquid, though we have never personally filled it too high because my son inevitably ends up pouring the water onto his high chair tray. Overall, I’d say that this transition cup is great for little hands. My youngest started using it after he developed an interest in drinking from grown-up cups (mainly coffee mugs and large glasses full of water). This felt like a safe learning cup, because it wouldn’t break once it was inevitably thrown on the floor. And he really enjoys drinking from his own mug. Made in China. Caveman Cups are a favorite of mine. Out of all the stainless steel cups we have tested, theirs stand out as being the highest quality. They are made from durable 18/8 stainless steel, and are stackable and light. They’re completely shatter-proof and suitable for 12 months and up, depending on your baby’s coordination. The company tests their products for purity and adds no chemicals, coatings, paints or plastics. They are dishwasher safe and come with a lifetime warranty. 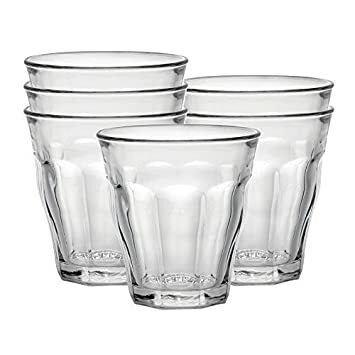 One great thing about Caveman Cups – and one reason they may be more expensive – is their unique rimless design. Many other stainless steel cups have a rim; this rimless version prevents dirt and debris from settling under the rim and developing mold. While I don’t love that these are made in China, I do trust the company’s record. Also, it is very difficult to find stainless steel products that are not manufactured in China. Since we rely on stainless steel so much in my home, avoiding Chinese-made products has proven to be difficult. I am comfortable enough with these cups to use them daily. Made in China and USA. If you’re looking for a glass toddler cup but worry about it breaking, this is a great option for you to consider. 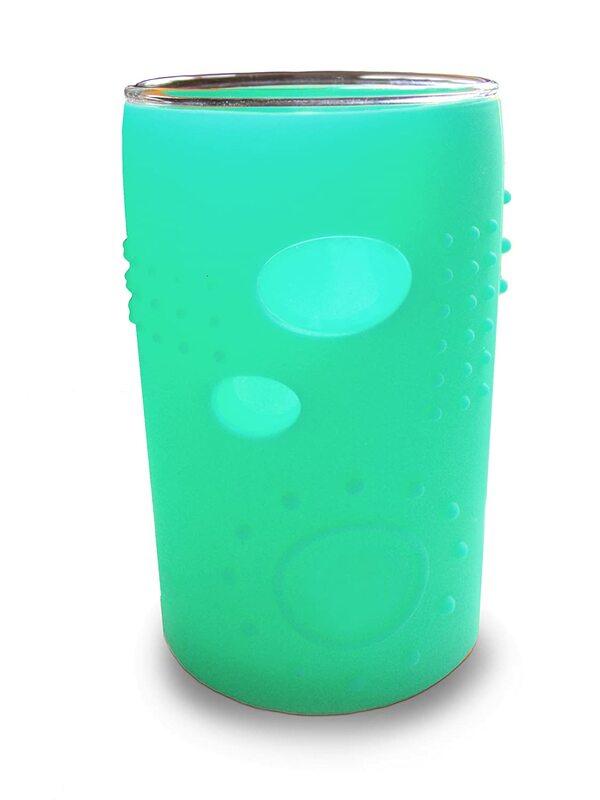 The Silikids Glass Cup comes with a protective silicone sleeve that helps prevent breakage. We have used these for over three years with no issues. They fit 6 ounces of liquid and are rather small. 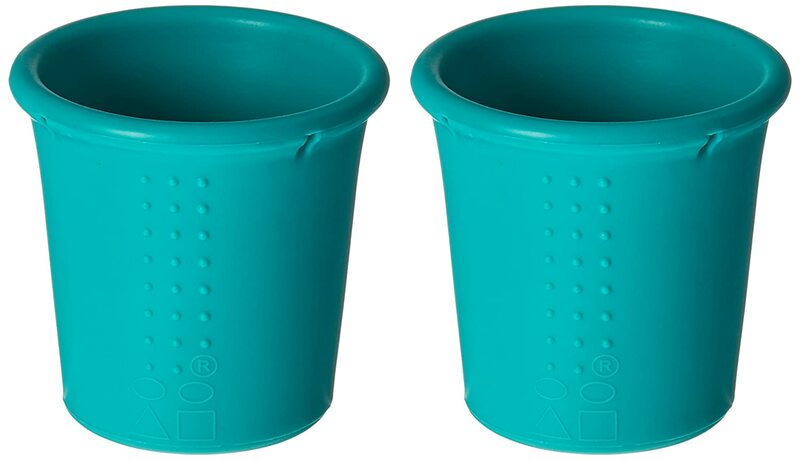 For this reason, I personally think they are better suited to younger babies/toddlers, but there are lots of reviews of parents whose older kids still like using these cups. I found them too small once my son got a little older, but they were very helpful for when we were transitioning to a regular drinking cup. They are dishwasher safe and overall just a great choice for babies or toddlers when you are first introducing a drinking cup. The silicone sleeve is made in China while the glass is made in the USA. Made in France. These Duralex tumblers are a classic. Made from tempered glass, they make a great option for parents who want to introduce a glass cup. They are extremely durable and perfectly sized for little hands. They also come in a variety of sizes for your baby as they get older. Made in China. These silicone cups make a great toddler learning cup. They’re made from durable, rigid silicone and hold up very well. They are also easy to grip, so they encourage your little one to drink from their cup by themselves. Made in China. If you’d prefer a smaller glass, you may want to consider using shot glasses. Like I said above, they’re for the more adventurous of parents, but many people swear by them. If you do go this route, be sure to order shot glasses that have no paint or writing on them so that you can avoid any risk of lead contamination in the paint. 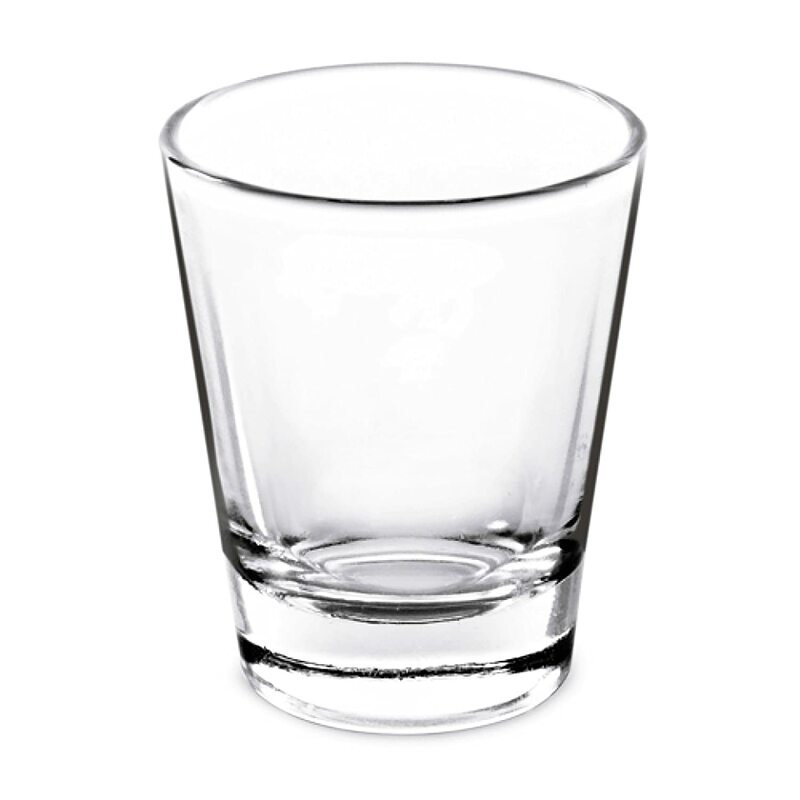 A clear, plain shot glass like these will do the job. Made in China. 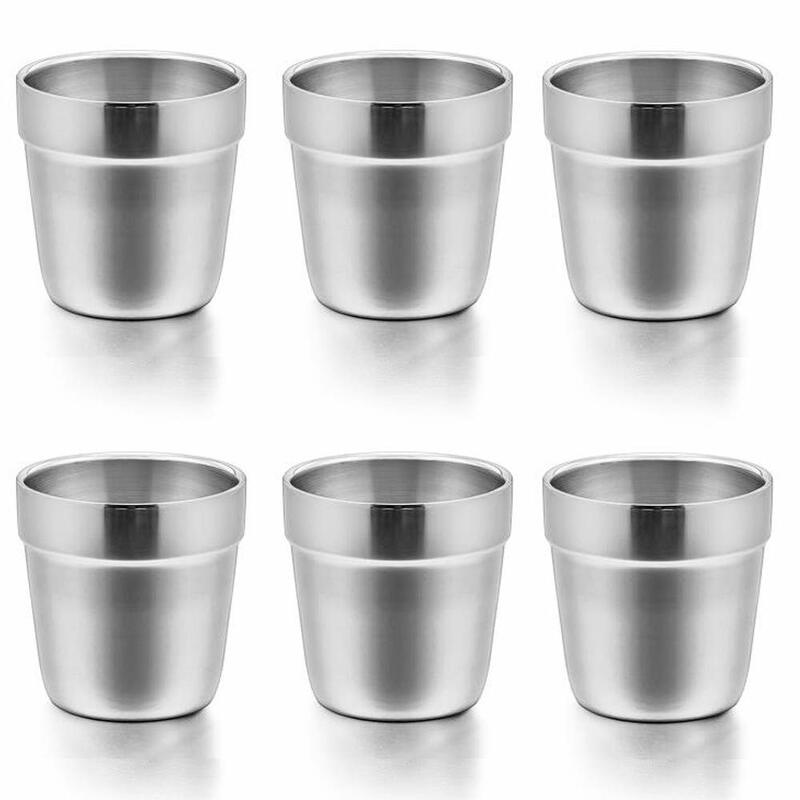 This six-pack of stainless steel insulated tumblers is a great deal. 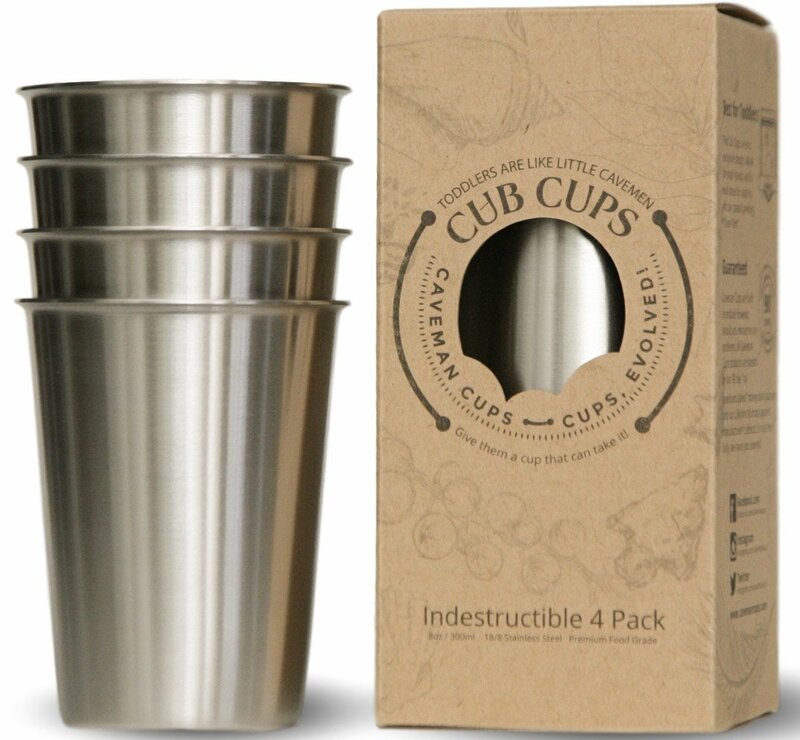 These cups are made from quality 18/8 stainless steel and are double walled, so your child’s hands won’t get too cold when using one of these cups. They make another great choice for a toddler learning cup. Though sippy cups may be more convenient, it’s worthwhile to be mindful of your baby’s natural developmental needs. 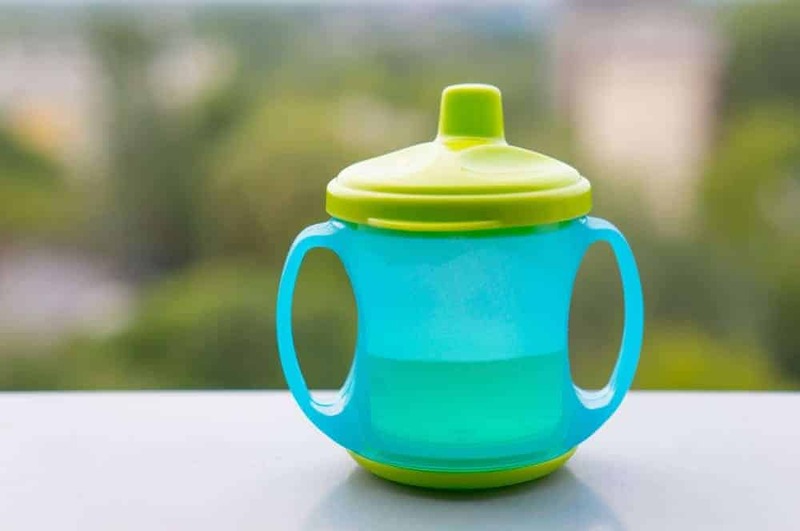 I believe these sippy cup alternatives are the best of the best and you can’t really go wrong with any of them, though the Green Sprouts Cup and Munchkin 360 Cup are probably the most popular. So, which sippy cup alternatives are you planning to try?